Amazing view from the hotel room, superb breakfast. Would come again. The hotel is on an exit from the autostrata. The setting is directly connected the river and park setting. The room was nice and the food was great, as was the wine. The owner speaks several languages and is very pleasant. Professional multilingual service. 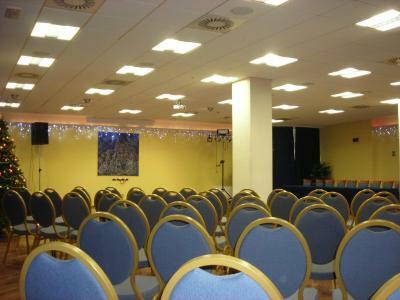 Great room and excellent dinner at a very reasonable cost. Breakfast to dream off. The receptionist lady was lovely, and so was one of the waiters in the restaurants; excellent location to visit the MUSE and the city. Good WiFi and free parking. Excellent restaurant on site. Perfect. We spent there only one night during trip to Italy and it perfect fits to our need. Dinner in restaurant was excellent. I had to go to Trento as an emergency and booked Hotel Sporting as it was the cheapest, so I wasn’t expecting much. But I was pleasantly surprised, rooms where well equipped, beds were super comfy and room was cleaned daily. The breakfast was surprisingly good and plenty to chose from. The minibar was well stocked and not too overpriced. Nice breakfast buffet with enough choices. Convenient location with free parking. Comfortable air-conditioned room with decent beds and clean bathroom. Hotel Sporting Trento This rating is a reflection of how the property compares to the industry standard when it comes to price, facilities and services available. It's based on a self-evaluation by the property. Use this rating to help choose your stay! 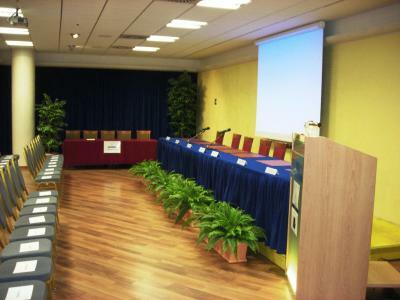 Located 0.6 mi from the Trento Sud A22 motorway exit, Hotel Sporting offers free Wi-Fi throughout. 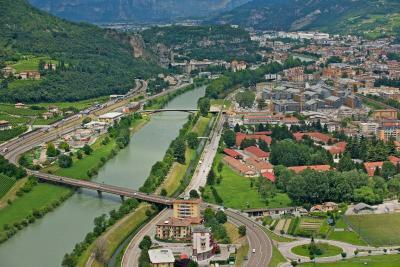 It is just 50 feet from the popular Val d’Adige bicycle track, and 0.9 mi from Trento’s historic center. Rooms and suites at Hotel Sporting Trento are air conditioned and come with an LCD satellite TV, a mini-bar, and balcony. Each has carpeted floors and a private bathroom with hairdryer. The Olympic restaurant and pizzeria is open for lunch and dinner and serves à la carte menus of Trentino cuisine, including cold meats and local cheese. During summer, meals can be served on the terrace. Bikes can be rented at the hotel, where there is also a free car park. The 14 bus stopping in front of the property links to the city center. Trento's San Vigilio Cathedral and the Buonconsiglio Castle are about 1.2 mi away. The MUSE museum is 1,650 feet away. 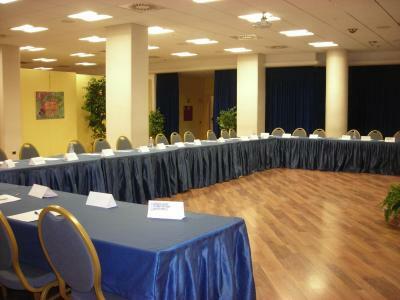 When would you like to stay at Hotel Sporting Trento? Air-conditioned room with LCD TV, a balcony and free Wi-Fi. Spacious room with 2 armchairs. It is air-conditioned and features an LCD TV, a balcony and free Wi-Fi. Air-conditioned room with LCD TV, a balcony and free Wi-Fi. Comes with a large double bed, a sofa bed, and a single foldaway bed. With a balcony, this air-conditioned room features a satellite flat-screen TV, mini-bar and private bathroom with a hairdryer and free toiletries. This air-conditioned mountain-view room is accessible for disabled guests and features a private bathroom with barrier-free facilities. House Rules Hotel Sporting Trento takes special requests – add in the next step! ATM card Hotel Sporting Trento accepts these cards and reserves the right to temporarily hold an amount prior to arrival. Hotel Sporting Trento accepts these cards and reserves the right to temporarily hold an amount prior to arrival. Please contact the hotel in the event of late arrival. Garage parking is available for an extra fee. The smell of smoke at reception, which was coming from the staff office just behind the front desk. Also one of our two rooms was very smelly of smoke (carpets and upholstery). It was old, smelly and moldy. The bed was not that comfortable and there was only a thin cover. Very nice personnel, clean and comfortable room. The lobby was conjested but very nice. It is just small.